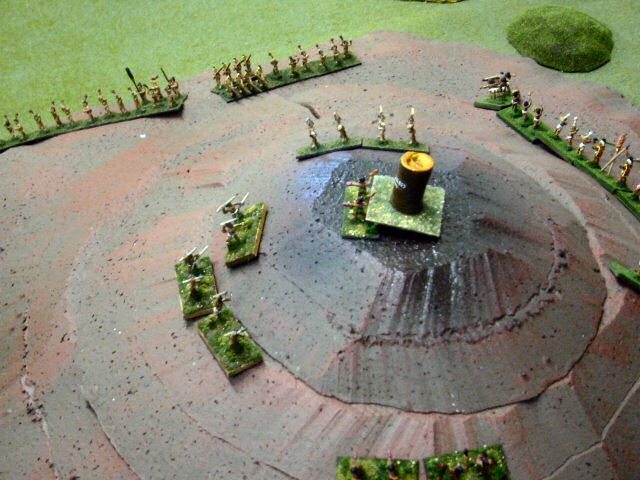 This article describes a battle scenario for two or more players based on therules for the miniatures game De Bellis Antiquitatis .For our battle, we used four armies of the IV/12 Polynesian Army,representing the armies of Polynesia or Melanesia in the years spanning 1100 A.D. to 1785 A.D..You need a symmetrical battlefield large enough for all armies and a large volcano in the center.Finally, you need a Tiki god or small statue on a square base the same size as the army units. To the right, a war canoe lands on the island with Mauna Loa in the background.The Tiki god stirs the volcano causing it to belch smoke and fire. To the right, four commanders of theLone Star Historical Miniatures clubbegin the charge of the armies up the mountain.The Tiki statue rests at the summit of the volcano. 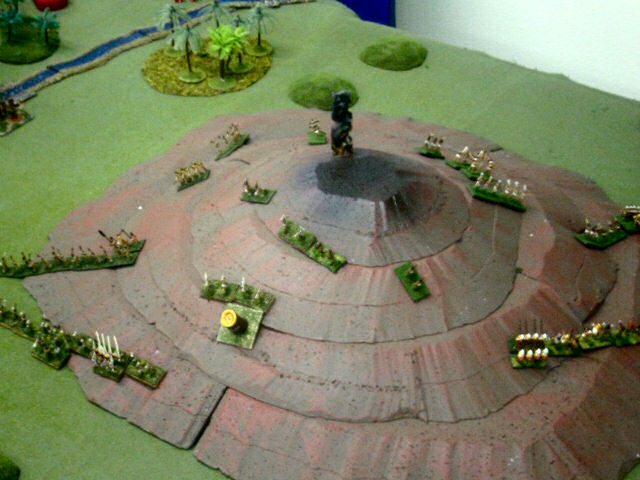 A Tiki statue is placed at the top of the large volcano at thebeginning of the game.All commander's armies start the game equidistant from the Tiki statue. Initiative for each turn is determined randomly. Thecommanders go sequentially. Thus, you might be the last general tomove in one turn, immediately followed by first in the next. The top 2 inches of the volcano are deadly lava fields. Eachunit in the lava fields must roll a 1D6 at the end of its turn. 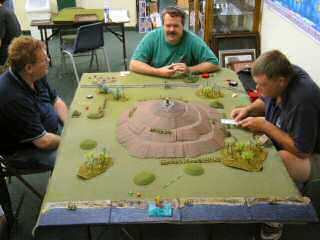 Onrolling a 6, the unit is destroyed by deadly lava. The first unit to touch the Tiki statue getsownership. Ownership confers +1 in battle. To steal the totem, anenemy unit must defeat the owner in battle.To signify ownership, place the Tiki statue behind the owner.However, the Tiki never interferes with unit placement, movement, or retreats.The Tiki is never destroyed by lava. The Tiki halves the movement distance of its owner unit. The game is won by defeating all enemy armies via the normal DBAcombat rules (4 units or the general), OR by getting the Tiki off yourhome side of the board. Units destroyed by lava count as defeated. 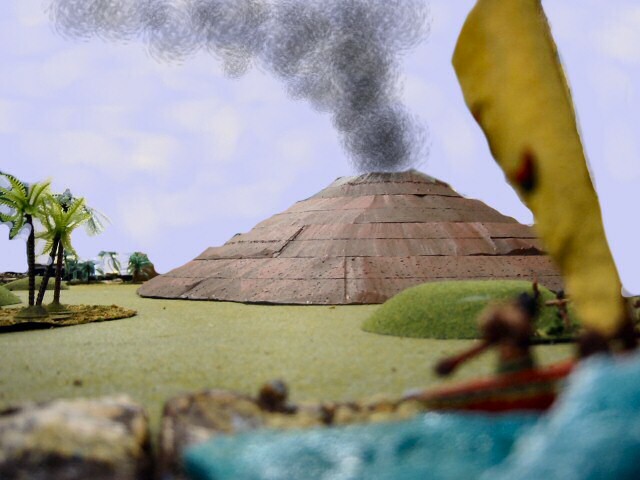 To the right, the Hawaiian psilois have charged to the top of the volcano.The top unit has grabbed the Tiki and is prepared to battle the other units.No unit has been destroyed by lava.Peli is kind. The heavyweight blades and pikes follow.They are slower than psiloi, but soon the heavies will enter the battle as well. A pair of psilois has stolen the Tiki and is running.Peli is angry and has killed a unit at the volcano summit. Other units line up and prepare to club each other withcoral and obsidian mallets. We had a lot of fun with Tiki Wars and will play again.In our first game, Dave-Kahuna ran away with the Tiki,but almost died with three causalties.All four commanders lost one unit to Peli,showing how we are equally esteemed. Thanks for stopping by and reading about my figures. Last modified: Thursday, 09-Jun-2011 12:42:14 MST.